We’ve been quite this busy this week with a potpourri of activity. 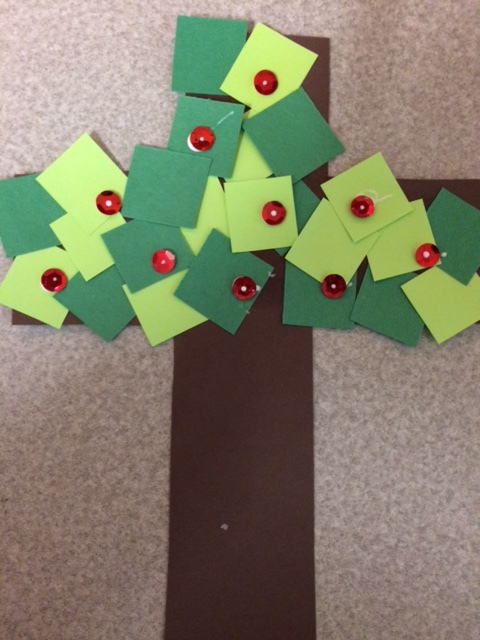 This week saw us create “t is a tree,” thanks again to Pinterest. We made a few modifications with our “fruit,” using sparkling sequins. The Kindergarten has come to expect there will always be lots of glitter, sparkles and sequins in most crafts we do. It was a bit of a relief for the children to work on “t” as the simple straight lines are ones everyone can understand. We’ve had quite a few challenging letters lately, such as ‘q” and “s” which have lots of curves and circles. It’s a good reminder for all of us that it’s ok to take a step back and work on something simple, practise our skills and feel successful with our efforts. 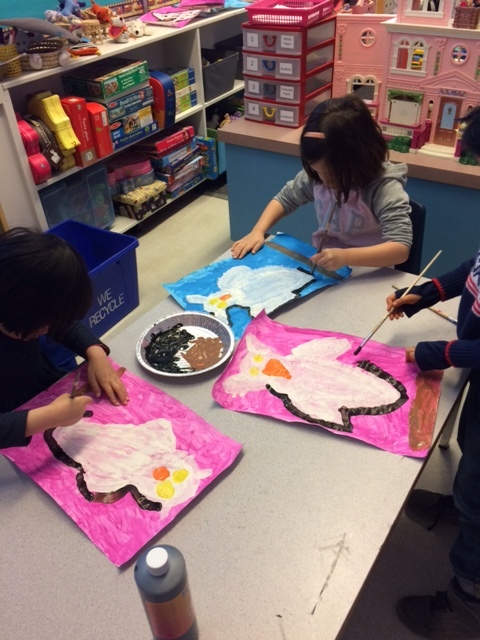 We’ve almost finished all of our beautiful snowy owl paintings from Deep Space Sparkle. This was quite a feat for Kindergarten. Every student painted their backgrounds (pink or blue) at the same time; that means liquid tempera paint on all the tables and every Kinder child has a paintbrush. The next day, everybody painted their owls white. We’re pleased to report we had no spills or major mishaps to the carpet. We moved to small groups for the next phase which was painting the details such as yellow eyes, orange beaks, a brown branch and black for outlining and other finishing touches. Funnily enough, lots of children got paint on themselves this time. In PE this term we have been learning to use small equipment such as bean bags, hoops, skipping ropes, frisbees and scarves. We learned how to safely use each piece of equipment during specific lessons. We’ve been focusing on staying in our personal space while moving around the gym, obeying whistle commands and cooperating with our small group in a station approach. We now have stations set up around the gym with specific tasks for each piece of equipment. Some fun dance music while we’re at each station has made it a lot of fun! We met with our Big Buddies to continue working on our iMovies. We’ve completed the research and image collection and now we’ve moved on to the business of movie making. You’ll be able to read more about our digital literacy projects in our next post. The Grade Two students in Mrs. Bird’s class also came to visit us on Wednesday with a Reader’s Theatre production from a Frog and Toad story. We were so pleased with the Kindergarten children’s attention and good manners throughout the student reading. We look forward to a visit from Mrs. Bundic’s Grade Two students next week. 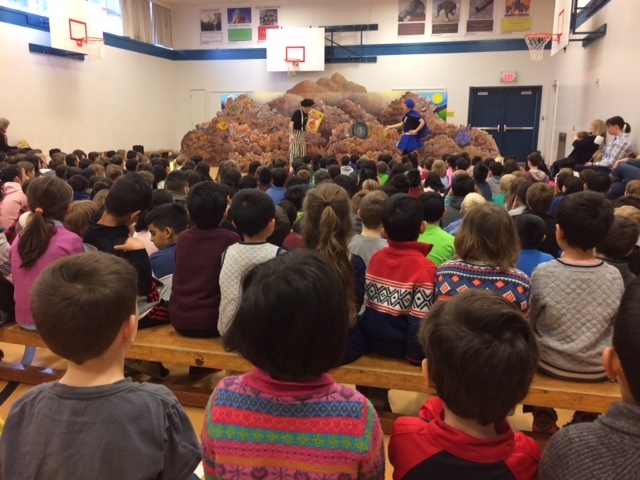 This was really good practise for us as on Thursday we joined Grades 1-5 to watch an excellent play by Dreamrider Productions called “Zero Heroes.” In this story, Esmeralda and Goober, our heroes, taught us about the importance of reducing, reusing and recycling. “Use it for a minute and it’s garbage forever” was repeated to us several times. Can you believe it’s already March? We cannot believe how fast we sped through February. 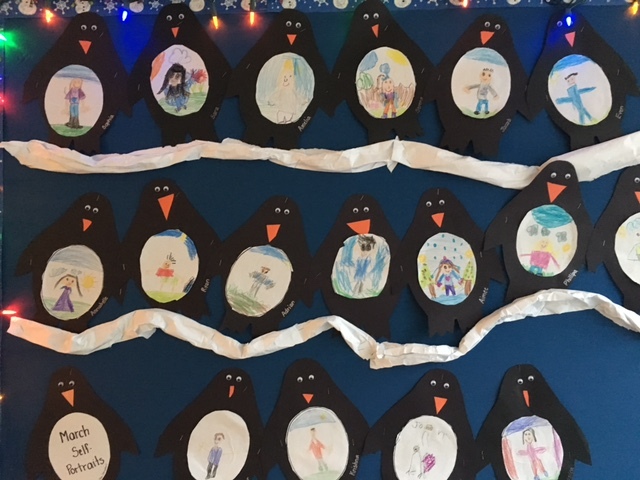 But another month has gone by so of course we had to draw our Penguin self – portraits for March. We are meeting with parents who are interested in helping us to plan our Persian New Year celebration in Kindergarten. We are meeting in Mrs. Daudlin’s room on Monday at 8:15. This meeting is for parents only. Please arrange to have your child arrive at school with another parent. Children are not allowed to wait in the hallway. Library is on Tuesday for both classes. Please remember to return your Library book. Friday, March 10 is the last day before Spring Break. All students are going to be dismissed at 2 pm. Please mark this on your calendar. School resumes on Monday, March 27. Ridgeview is sending home Second Term Report Cards on Friday, March 10. We are unable to send them home before that time if you are leaving early for Spring Break. If you are going to be away before or after Spring Break, please inform us and the office.